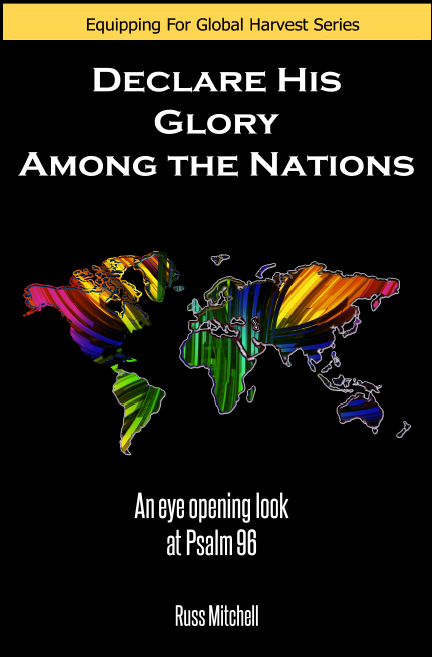 The Student Volunteer Movement 2 recently published a book that I wrote, Declare His Glory Among the Nations: An Eye Opening Look at Psalm 96. Psalm 96 is one of the most amazing missions passages in the entire Bible. It provides us with the mandate, the motives, the message, and the model that we need to understand our part in God’s plan to be glorified among the nations. These meditations on Psalm 96 offer an eye opening perspective about how we can “tell of his glory among the Nations in the 21st century. Declare His Glory Among the Nations is available from Amazon.com in both book and Kindle formats. If you wish to preview a book before buying, here is the table of contents and chapter one, “First Things First”. If you feel challenged and mildly uncomfortable after reading this book, it is not an accident. Russ weaves a solid exegesis of Psalm 96 wit compelling strategic information on the unfinished task and hard practical questions born of decades of missionary service. If you like information without application, leave Declare His Glory Among the Nations Alone. Psalm 96 puts a song in our hearts… a symphony of God’s greatness resounding among the nations. In Declare His Glory Among the Nations, Russ Mitchell communicates this Great Commission melody in high-definition. He skillfully highlights God’s plan for us to join him in bringing a crescendo of gladness to all peoples everywhere. Written by a missions veteran, this book will encourage you to join the movement of message-bearers t the world. I love the practical insights Russ gives the reader. I have been involved in discipleship training and world mission for more than 45 years, and I was still deeply impacted and inspired by the depth of insights from this well-known Psalm. Russ Mitchell has done the body of Christ a great service through writing this book. .Russ is an authority on these topics as he has spent many decades as a “Message Bearer” himself. He masterfully weaves together critical insights for the mission movement. His is a trusted voice who is doing what he is calling others to do. Declare His Glory Among the Nations is available from Amazon.com. If you desire to purchase multiple copies, contact me directly.